The ‘Comah has been a must-visit summer destination for surfers, families, beach-goers and music lovers since 1978! It’s the ultimate beachside location, with something for everyone. 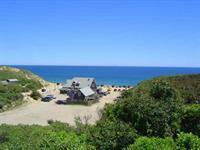 The live music, cool cocktails, fantastic food, stunning scenery and friendly atmosphere create a Wellfleet oasis. Open Memorial Day Weekend - Labor Day Monday.